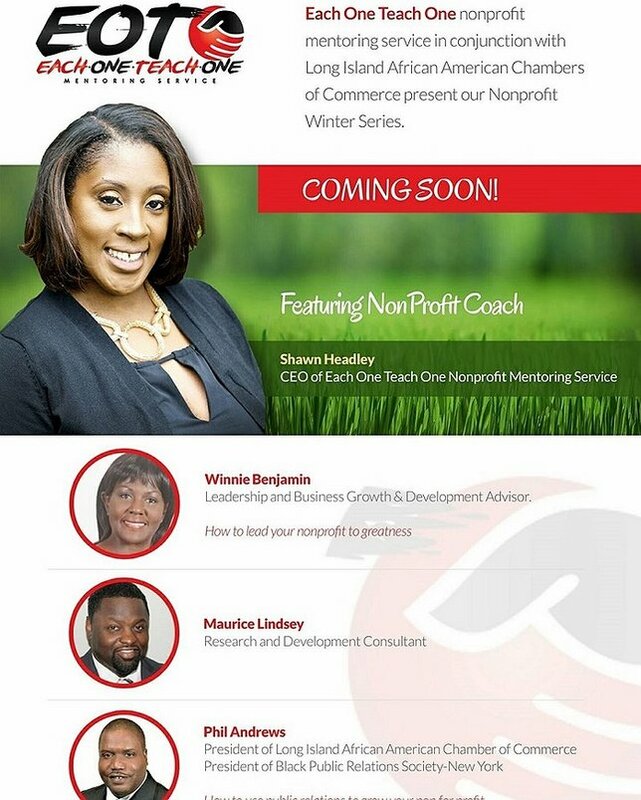 New York, NY - December 16, 2016 - Each One Teach Mentoring Service Announces EZ Sign-up for its Non-Profit Winter Series geared towards helping non-profits navigate challenges and growth through various stages of development in their perspective organizations. It isn’t easy when you’re just starting out–believe me, we know. It took countless hours of research and phone calls to learn what we needed to get our dream up and running at Each One Teach One. There were so many long nights spent looking up how to get the endless amount of paperwork done. After such a long ordeal we launched a successful non-for-profit geared towards helping non-profits through various stages of their growth. Visit Each One Teach One Mentoring Service online. To sign on to the Winter Non-for-Profit series today for updates and future events, go here or email inquiries here. Subject: LongIsland.com - Your Name sent you Article details of "Each One Teach Mentoring Service Announces EZ Sign-Up for Non-Profit Winter Series"